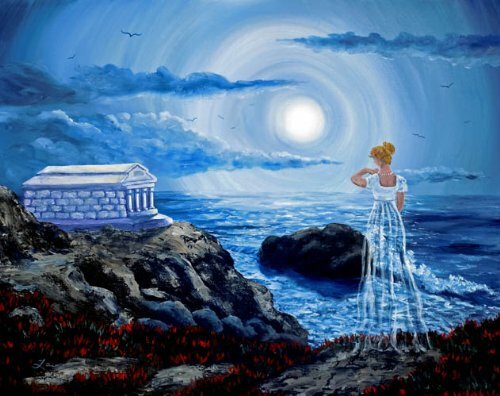 "Her Tomb by the Sounding Sea" The ghost of Annabel Lee, forever a maiden on the brink of womanhood, stands in the red iceplant on the bluffs overlooking the sea. She wears a white regency gown with a string of pearls, her blond hair swept up in a bun. The full moon illuminates the Grecian-style sepulcher on the rocky cliff. This Gothic fantasy landscape, inspired by the "Annabel Lee" poem by Edgar Allan Poe, is an original acrylic painting on a gallery-wrapped stretched canvas (the 3/4" sides are finished off in brown acrylic). It has been lightly varnished to protect the paint and preserve the lustrous colors. By California Artist Laura Milnor Iverson. Each painting is a unique original. There is only one.